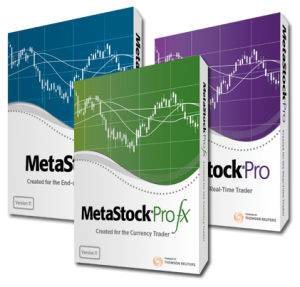 MetaStock is the industry leader in charting and technical analysis software for the individual trader of stocks, commodities, indices, bonds, foreign currencies, and much more. MetaStock’s real power is not just in the software, but within the data that powers it. Powered by Thompson Reuters, the #1 supplier of financial data across the world, MetaStock is backed by data that you can trust, and unlike other cheaper run of the mill applications, is designed with “ease of use” in mind. Compatible with most Windows PC’s and Mac computers that are running a virtual drive, MetaStock is accessible, easy to use, and most importantly, it is reliable when you most need it to be. As a trader, it is imperative you’re able to read the market accurately, so that you can make snap decisions at the right time, to trade and sell at precisely the best possible moment. MetaStock understands this, which is why MetaStock caters to both “End Of Day” and “Real Time” traders – including compatibility with two leading data services, QuoteCenter, and Reuters Datalink. Each of these services supply highly reliable and clean data from Thompson Reuters. It’s as simple as this: whether you’re looking to trade casually or make it your career, you must be able to enter and exit at the most profitable possible moment. MetaStock will provide you with the right data, and the right tools to achieve your trading goals. What’s more, the real power in the software lies within its ease of use. All too often, software of this nature can be hard to use, and requires a large amount of special training in order to use it. MetaStock is different. It’s very easy to use – so much so, that you only need basic computer skills to use it to its full potential. Want to give MetasStock a try? Try Metastock today.